Improve Your Air Conditioner Efficiency. Clean that Evaporator Coil! It's been a pretty hot summer here in the Mid-Atlantic. Temperatures have been in the high 90ºs for several days, and the humidity has often been unbearable. During this kind of uncomfortable weather, we are reminded how the contractor who built our house must have saved a few bucks by skimping on the size of the heat pump / air conditioner. The system is adequate for nine or ten months of the year, but in extreme heat or cold, it simply cannot keep up. We've always been good about maintaining our HVAC system's components to get the most efficiency possible and to help save on our household energy costs. At a minimum, we keep the outdoor condensor unit clear of debris and give it a good water rinse several times each year. We also change the filter in the air handler on a regular basis, at least every three months if not more often during heavy heating and cooling periods. It was during the most recent filter change that I had the idea to inspect the evaporator coil. You do know what an evaporator coil is, right? [grin] Okay. 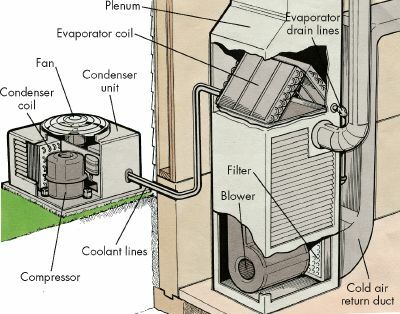 If you are not familiar with how a heat pump / air conditioner works, here is a really (really) short primer. A heat pump / air conditioner works on the basic principle of heat transfer. 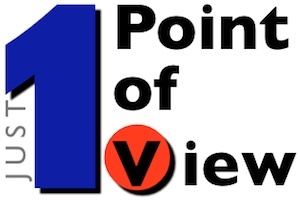 The device moves heat from one place to another; either from outside the house to inside (for heating) or from inside the house to outside (for cooling). This process is done by using refrigerant as the heat transfer medium, a compressor to move the refrigerant, and two sets of coils; one outside the home, the other inside. Although the components all make it look rather complicated, the concept and technology is really pretty simple. I've already mentioned the outdoor condensor unit. Many people already understand the importance of keeping this device clear of debris and clean. It certainly helps that the unit is relatively large, obvious, and many times kind of noisy. That serves as a good reminder to give it some attention. 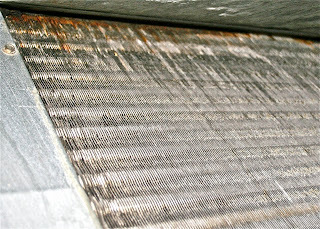 The evaporator coil is just as important to the function of the heat pump / air conditioner. However, since it resides snugly inside the air handler hidden away in your house, it is rather inconspicuous and often ignored. 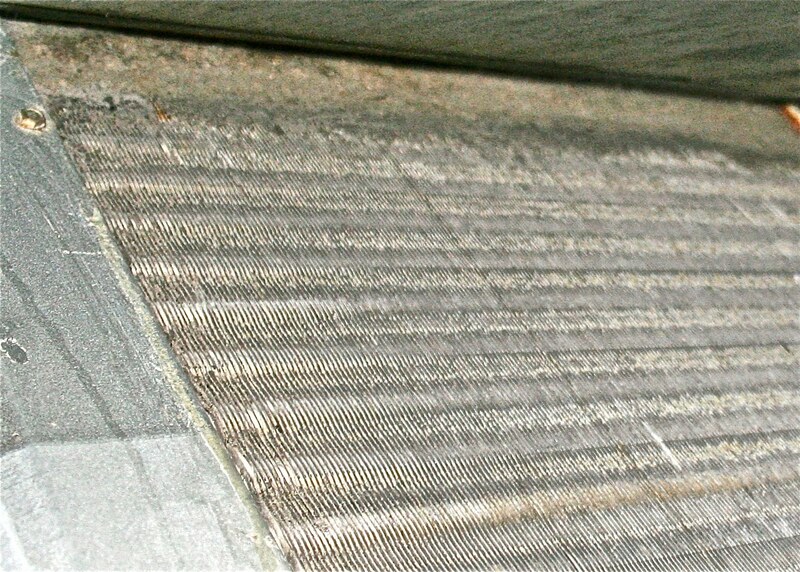 In theory, if you use a good air filter and change it on a regular basis, the evaporator coil should remain clean and tidy. At least that is the theory that I always worked under. I was prompted to look at the evaporator coil after I had noticed that the air conditioner had become less efficient over time. Even after changing the filter, the air flow from the vents throughout the house was not as cool or as strong as I expected it to be. I knew that there was a problem and suspected that the compressor was failing or that the refrigerant was low. After disconnecting the electrical power to the compressor and the air handler, I removed the access panel to the evaporator coil. The first thing that I noticed was how very cold the evaporator coil was. The compressor and refrigerant level was obviously okay. Then I noticed how the filter really didn't fit that well. It was the correctly-sized filter for this air handler, but the design allows what I consider too much space around the filter's perimeter. 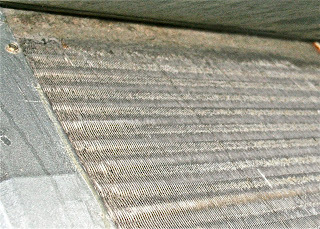 Then, when I looked at the evaporator coil, I realized that the space around the filter was quite likely the source of my air conditioner's loss of efficiency. To be fair, I have seen worse. In another house where I lived, the previous owners had removed the filter completely and operated the heat pump / air conditioner without one. The result was an evaporator coil that was almost entirely plugged. However, I was surprised at the amount of dust and debris collected on this evaporator coil since we had been so good about maintaining the filter. I knew that I could carefully remove the obvious dirt with a vacuum and brush, but it would be difficult to adequately clean the critical area between the fins of the coil without some assistance. The space is very confined and too difficult to tackle with a water bath or spray, so I decided to use a solvent that was made for the job. The local home improvement stores were well-stocked with cleaning solutions for the outdoor condensor unit, but none of them seemed to have anything that was made for the evaporator coil located inside the house. I was very concerned about what I used to clean the evaporator coil. I had very legitimate concerns with the solvent's safety. Be certain what you use is non-flammable, non-conductive, and non-toxic. This is critical to your safety while performing the cleaning, and for the safety of the building inhabitants (both humans and pets) after you place the system back into operation. The risk of possible explosion, fire or toxic effects is real and must be carefully considered. A day of research helped me to discover the Virginia Brand, Blast-A-Coil coil cleaner, distributed by Parker Hannifin Corporation and available for purchase on line from several industrial supply retailers, including Grainger. This solvent was perfect for the job. The coil cleaner comes in an 18 ounce aerosol can. It is made to clean grease, dirt, lint and other debris from the coil surface, and it does not require rinsing after application. More importantly, it is USDA accepted for use in federally inspected meat and poultry plants; it's safe to use indoors and around humans. The Blast-A-Coil solvent is primarily trichloroethylene. This is a strong and effective cleaning agent, with an interesting history of being used as a medical anesthetic. Prolonged and repeated exposure to trichloroethylene can have serious health consequences, but it is considered safe to use in well-ventilated areas for short periods of time. I purchased two cans of the cleaner, and recommend that quantity for a typical residential application. Before using the cleaner, I used a vacuum and stiff brush to carefully remove as much of the debris from the evaporator coil as possible. Then after placing a portable fan to blow fresh air in the direction of the air handler and donning safety glasses, I liberally applied the solvent cleaner. The contents discharged quickly from the can in a strong spray / stream, so it should be aimed and applied very carefully. After allowing the residual solvent to completely evaporate, I inspected the newly cleaned coil. I was pleasantly surprised to observe that it was noticeably much cleaner! I reassembled the air handler, installed a new filter, and reconnected the electrical power to the compressor and air handler. Now it was time to test the air conditioner to see if my efforts made a difference. Without an anemometer or air flow meter, I cannot provide an exact metric for the improvement. However, I can vouch that the temperature and volume of air coming from the vents throughout the house has greatly improved. And even though the heat pump / air conditioner is not as large as I would like, the unit we have installed is now much more efficient at heating and cooling the house helping us to be more comfortable and saving energy at the same time. When diagnosing the operation of your heat pump / air conditioner, don't forget all of the components; especially those that stay tucked away inside the air handler in your house. 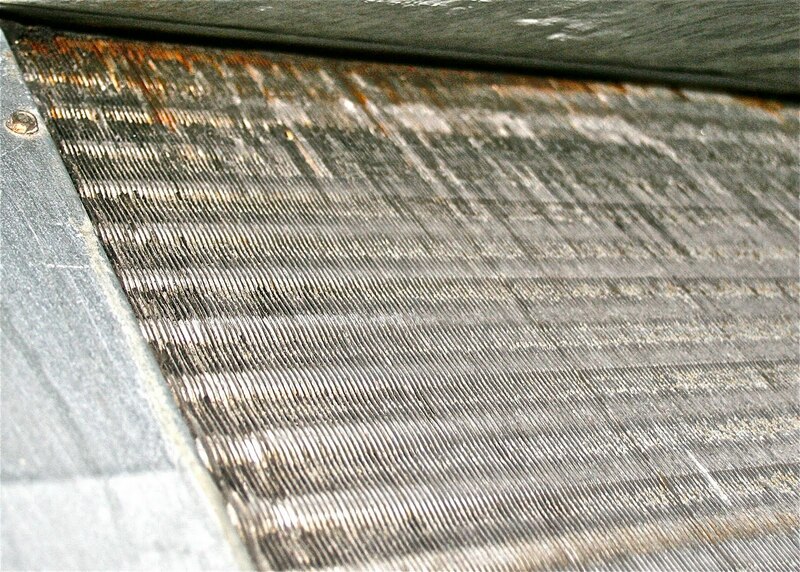 Maybe your evaporator coil needs to be cleaned like ours did. Cleaning it of dirt and debris will make a real difference!